Grab an easy-to-carry light cannon—the PEAK® 600 Lumen LED Rechargeable Spotlight. 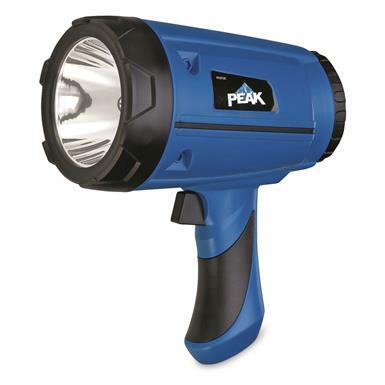 It delivers a high intensity beam wherever your outdoor needs take you. Lightweight and easy to carry, this lightweight LED Spotlight is FL-1 rated for lumens and runtime. The powerful Li-ion battery gives you longer runtimes, less weight, and more recharging cycles. Perfect for boat use thanks to the waterproof rating and durable case that floats if accidentally dropped in the water.